The SUNY College of Environmental Science and Forestry will once again bring its hands-on science activities to the New York State Fair, this year in a new location. 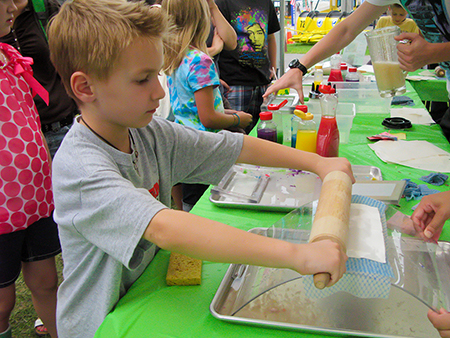 Saturday, Aug. 23 - Department of Environmental Resources Engineering with hands-on hydrology activities; environmentally friendly arts and crafts from 6-10 p.m.
Sunday, Aug. 24 - Environmentally friendly arts and crafts from 10 a.m. to 1 p.m.; Top 10 New Species display and the American Chestnut Research and Restoration Project from 1 to 4 p.m.
Monday, Aug. 25 - Make your own handmade paper with the Department of Paper and Bioprocess Engineering from 10 a.m. to 6 p.m.; environmentally friendly arts and crafts from 6-10 p.m.
Wednesday, Aug. 27 - The Department of Forest and Natural Resources Management will hand out tree seedlings and planting information from 10 a.m. to 6 p.m.; environmentally friendly arts and crafts from 6-10 p.m.
Thursday, Aug. 28 - Try your hand at electromagnetic chemistry with ESF's Chemistry Department from 10 a.m. to 6 p.m.; environmentally friendly arts and crafts from 6-10 p.m. The ESF College Bookstore/Alumni Office will be at the Taste of New York area Aug. 28 offering samples of the college's maple syrup along with maple cotton candy and maple sno-cones. The Great Lakes Research Consortium, with ESF and New York Sea Grant, will be at the fair for all 12 days and will be located in the New York State Parks area. This exhibit will present activities focused on water quality monitoring as well as New York's rich underwater resources. The New York Natural Heritage Program, which is hosted by ESF, will have a display on the NYNHP/ESF-State Park partnership along with some biodiversity activities. ESF's mascot, Oakie, will make an appearance at the SUNY exhibit Aug. 27.